Jen Kirkman heads out on a brand new tour! The outspoken feminist comic hits the trail! A regular on the Chelsea Lately show as a round-table panellist, Jen has cut her teeth in comedy with the best, having also worked with Funny Or Die, and Drunk History. With four comedy albums under her belt, her latest offering Just Keep Living? was released in 2017 to great praise. Now she heads out on the road across North America to tour her outspoken, and proud feminist material, covering subjects from abortion, menstruation, street harassment and Twitter rants. As one of the writers for the Emmy and Golden Globe-winning Amazon series 'The Marvelous Mrs. Maisel' Jen has been delighting her fans with her written word too, with her 2016 book 'I Know What I'm Doing & Other Lies I Tell Myself' was featured as one of the New York Times bestselling list. Don't miss your chance to see this comedy genius live! Seen Jen Kirkman? Loved it? Hated it? Sound good to you? 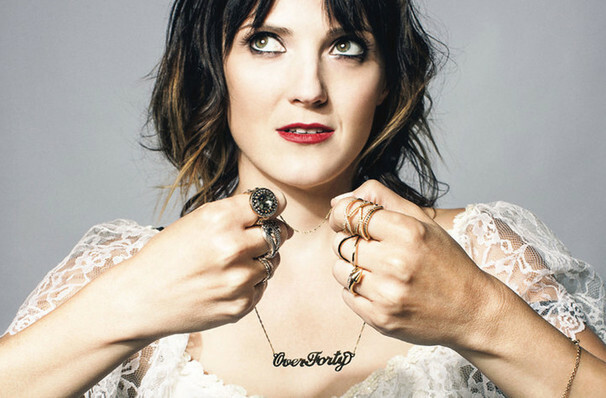 Share this page on social media and let your friends know about Jen Kirkman at Rex Theatre. Please note: The term Rex Theatre and/or Jen Kirkman as well as all associated graphics, logos, and/or other trademarks, tradenames or copyrights are the property of the Rex Theatre and/or Jen Kirkman and are used herein for factual descriptive purposes only. We are in no way associated with or authorized by the Rex Theatre and/or Jen Kirkman and neither that entity nor any of its affiliates have licensed or endorsed us to sell tickets, goods and or services in conjunction with their events.